I recently found the website Cricut Cardz Challenge. They post a challenge every Wednesday that encourages you to use your Cricut. This week it was to use a tea cup from any Cricut cartridge. Luckily one of the 2 cartridges I have does include a tea cup (Don Juan). My scrapping group just had a crop at a local yarn shop called Fiber Cafe. They happen to have enough table space to host. Anyhow, I made this card for the owner thanking her for letting us use her space. She also had coffee, tea, and brownies in the cafe for us. Next Did I Mention I Won? So glad you had a cartridge that included a cup so you could join us this week at Cricut Cardz. Love your cheerful colors you used on this card. 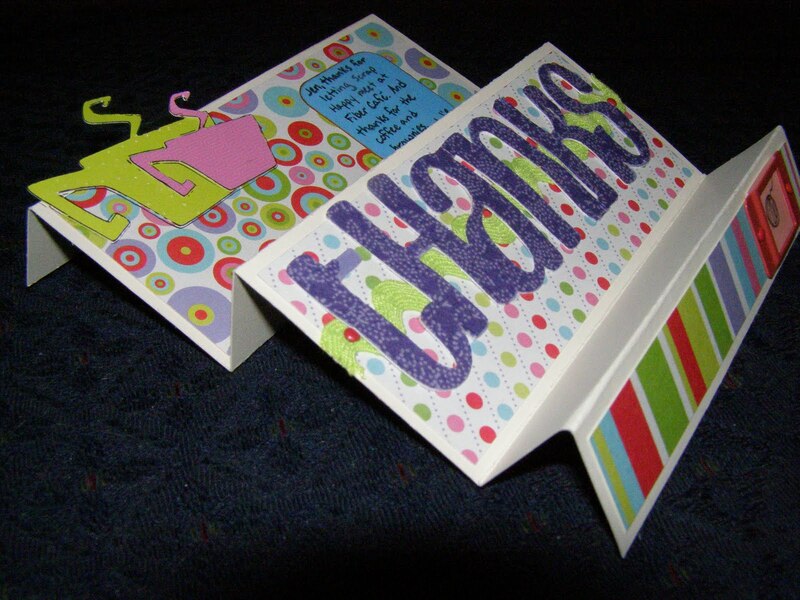 Very nice card, love the accordion fold, thanks so much for joining CCC. nice card, love the colors!